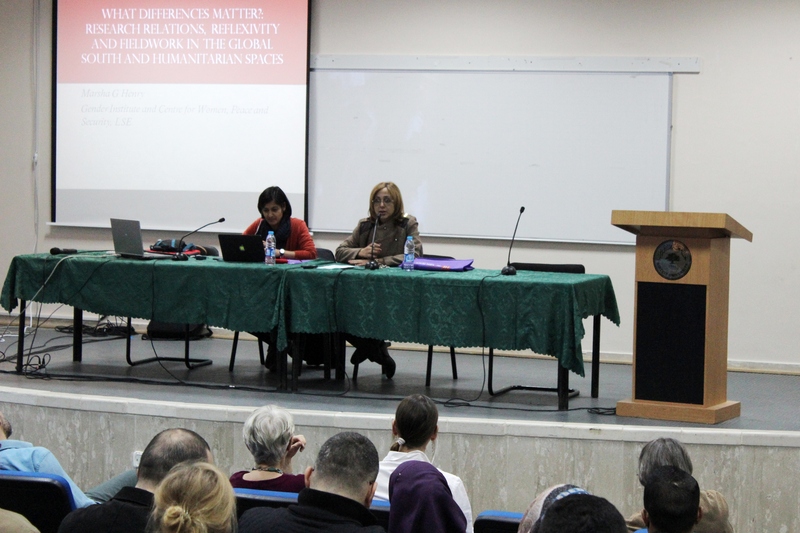 In her lecture “What Differences Matter: Research Relations, Reflexivity and Fieldwork in the Global South and Humanitarian Aid Spaces”, Dr. Henry discussed the changing role of female academics and scholars in different arenas, and how researchers tackle feminist issues. Henry assured that gender is about different axis of identity such as ethnic and racial differences. She alluded that not anticipating about ethnicity and gender could be factor in a female ability to gain access and conduct work. Drawing together on the work of five feminist scholars whose research spans diverse militarized contexts, Henry’s second lecture talked about military masculinity, intersectionality and male vulnerability in feminist critical military studies. Henry started from the work of earlier black feminists, Kimberlé Crensha who developed the term intersectionality to critique the ways in which race and gender were treated as “mutually exclusive categories of experience and analysis. She pointed out that intersectionality – which has become more structured as the understanding that subjects are constituted through intersecting, overlapping, and multiple strands of identity – has been widely taken up within and beyond feminist theory as a concept, methodology, and a tool. Based on her studies, Dr. Henry said that vulnerability among men who live in conflict contexts, such as refugee camps, are in so much pressure to present their full masculinity, and they are either subject to different ideology orientations, and therefore they act violent or are subject to acts of violence. Dr. Marsha Henry is Associate Professor and Deputy Director of the Centre for Women, Peace and Security. She joined LSE in July 2009, having previously taught at University of Bristol, University of British Columbia, Canada, the Open University and Warwick University. Before studying for a Master's in Gender and International Development at the University of Warwick. She continued her postgraduate studies at Warwick obtaining a PhD in Women and Gender in 2001. She carried out postdoctoral research in the Centre for Women's Studies and Gender Relations at the University of British Columbia, before returning to the UK in order to take up a position at the University of Bristol in 2002. Before taking up her post at LSE, she was a lecturer in the School for Policy Studies (2002-2006) and the Politics Department at the University of Bristol (2006-2009).